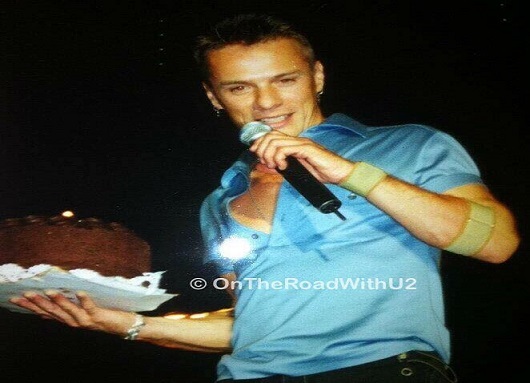 Home » Elevation » Happy Birthday Larry Mullen Jr! Elevation Providence2 10.31.01 – Larry’s 40th Birthday and my 40th U2 concert and favorite one ever! Happy Birthday Larry Mullen Jr! 16 years ago today we celebrated your 40th birthday at my 40th U2 show, my favorite concert ever – the Elevation Tour Providence2 October 31, 2001. Thanks for the drink! We woke up at 8am the morning of October 31st. We went up to our warm hotel room for a couple hours and had some breakfast. We stayed in the GA line all day without leaving, except to take a shower around 3:30pm. I made a huge orange (my favorite color) Birthday Card for Larry and had everyone in the GA line sign it. I put my name and email address on the back just in case. I was optimistic back then, and maybe a little delusional. I had also brought an Elvis motorcycle shirt to give to Larry as a birthday present. Tasha, Paola and I wore our “Larry Mullen Band” shirts standing up front at the rail between Bono and Adam. I held up the birthday card for Larry as U2 walked on stage, but I don’t think Larry saw it. There were many signs that night including one saying, “Bono let Larry sing,” but that did not happen. During “Elevation,” Bono sang, “Celebration” then said, “Happy Birthday.” After “Stuck in a Moment,” Larry’s 40th birthday celebration began. 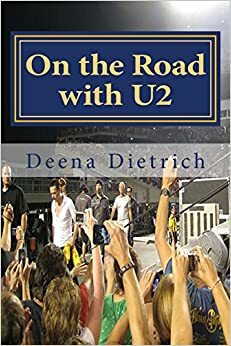 This show was not only my favorite Elevation show, but my favorite U2 show ever. I doubt there will ever be another night like it. Granted it was Larry’s 40th Birthday, and I love Larry, but it was also fantastic for the rarities U2 played that night. “Slow Dancing” was played for the first time on the Elevation Tour, and only the 11th time ever. “Party Girl” and “Wild Honey” were played for the first time on that leg of Elevation, and I have only heard those songs a couple of times ever. There was a great energy in Providence that night. I still have that champagne bottle on my shelf, next to Larry’s drum stick he gave me in Jersey on Elevation and the 2 he gave me in Denver on ieTour. I find it interesting that my 40th U2 show was Larry’s 40th Birthday show. Coincidence or fate?